If you couldn’t sprint the distance, then you really were in strife. There was one in every back yard, outside every house, in every town. But it really made no difference, they were just a port of call. That you wouldn’t make the dunny with them turkeys hangin’ round. You could even hide from mother, so you wouldn’t get the strap. We used the pathway for the wicket and the dunny door for stumps. He read the daily back to front in that good old thunderbox. You always sent the dog in first, for there was no flamin’ light. But never ever showed themselves until you sat inside. You could sit and chat to them, if you left the door ajar..
Then of course the magpies were there to peck you on your head. If you had an urgent call, you ran between the drops. And he would leave an extra can, if you left for him a Zac. 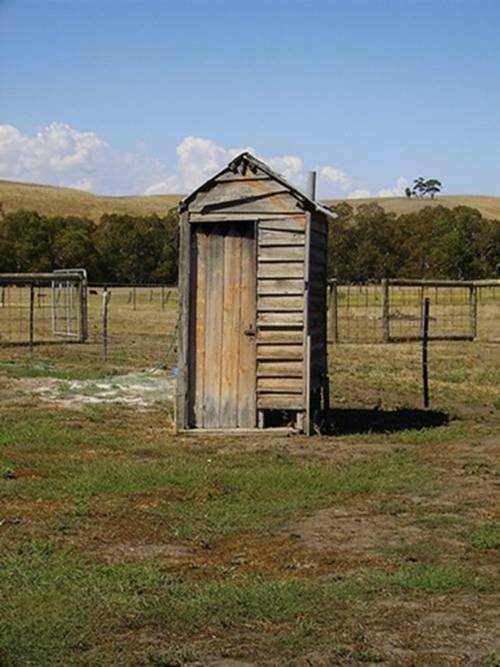 a dunny out the back. Oh, Memories! Ours was quite a trek from the house through lots of shifting sand so not easy to get to. Poor Dad had to try and dig a big hole (in the sand) to empty as the bucket filled! I have never been able to erase the feel of that newspaper – thank goodness for modern technology. It really was a “bush loo”. Hi Kate, ours was in the backyard, a nail for the newspaper stuck on the back of the door and a small candle in the winter to stop the water in the toilet from freezing. My grandfather used to sit in there until he had read his Daily Paper. Thank God when we eventually had an indoor toilet. Those were the days. But happy days. We were lucky because the worse creepy crawlie we had was a spider but they aren’t poison. Oh I remember only too well!! Thanks Kate needed a giggle today! haha, met too! We had them on the farm, and as they filled up, they went further away from the house, quite a trek in the middle of the night! My eldest sister had a double one when she was first married, one for mum, and one sized for the toddler!